Seven Masai giraffes have been born at the Santa Barbara Zoo since 2012. The giraffe family here at the Santa Barbara Zoo is just a small part of the population of 104 Masai giraffes that live at 28 accredited zoos in North America. Since Michael is the most genetically valuable male Masai giraffe anywhere outside of Africa, our Zoo plays an important role in the overall population. This is why our adorable calves go off to start herds of their own (at other AZA-accredited zoos) and contribute their valuable genetics to the overall population. ”Michael hangs out at the Feeding Deck, and guests wonder if he gets full from all the lettuce he’s fed. We don’t worry about overfeeding him with lettuce because it is just fiber and water, and has few calories. Giraffes eat the equivalent of 2 percent to 4 percent of their body weight every day. For Michael, who weighs 2,700 pounds, that is split between 32 pounds of alfalfa and 23 pounds of specially-formulated herbivore grain pellets. Giraffes are the tallest land mammal, and the Masai is the largest subspecies, growing to more than 17 feet tall and weighing 2,700 pounds. But even at that height, they have the same number of vertebrae in their necks as humans do. 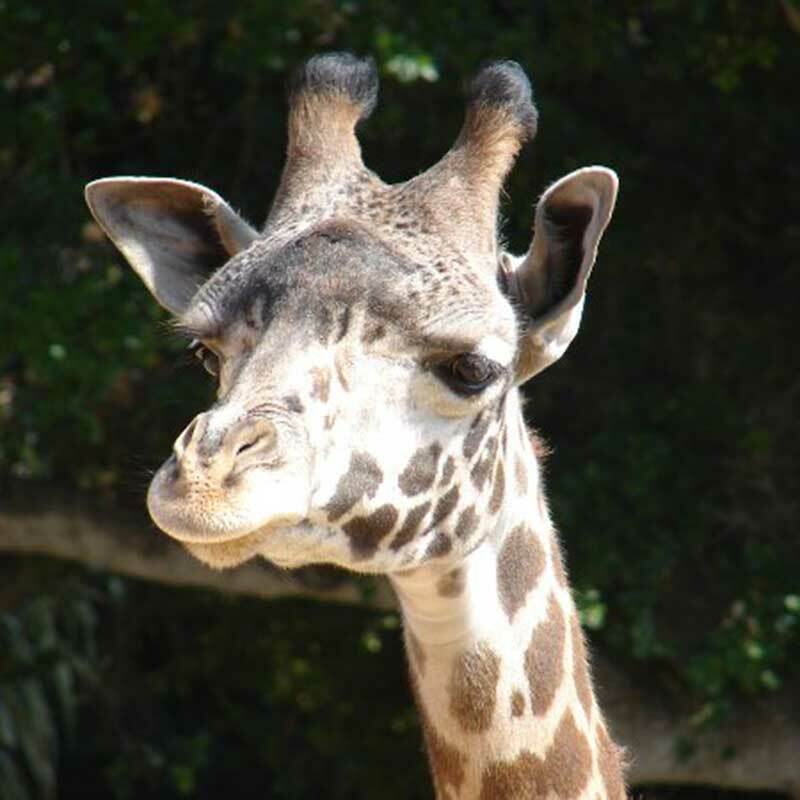 Gemina was a Baringo giraffe with a crooked neck who lived at the Zoo for 20 years, until her death at the old age (in giraffe years) of 21 in 2008. No one knows why her neck gradually became crooked. She was born at the San Diego Wild Animal Park in 1986 with no known medical issues, did not appear to be in discomfort and was treated as a normal member of the herd. A new book recounts and celebrates her life. Recently, Gemina’s rearticulated spine and skull have been put on display in the Zoo’s Discovery Pavilion. We’ll never forget her! Giraffe populations have seen huge declines in the wild, and the IUCN Red List recently changed their status from “Least Concern” to “Vulnerable.” Currently, the number of Masai giraffes in Kenya and Tanzania is estimated to be 32,000. They are at risk due to poaching and habitat loss/degradation.